The prosecutors’ latest search and seizure of the Fair Trade Commission was purportedly to look into its suspected backscratching ties with top-tier business groups and to check on potential power abuse by the antitrust watchdog. But the abrupt action was also viewed as a chronic power struggle between the prosecution and the FTC -- often dubbed “prosecutors in the economic realm” -- over the latter’s expansive range of rights concerning fair trade rule violations. “We will faithfully respond to the investigation and humbly embrace the given results,” said FTC Chairman Kim Sang-jo in a radio interview with KBS on Thursday, pledging for further efforts to regain the public‘s trust. A day earlier, investigators from the Seoul Central Prosecutors’ Office raided the FTC’s office in Sejong City on the allegations that former senior officials of the watchdog took post-retirement jobs related to their former tasks. Under the current Public Service Ethics Act, senior government officials are banned from taking jobs related to their duties for three years following their retirement. The surprise search and seizure appeared to change the momentum for the watchdog’s reform drive upon its expanded leverage under “chaebol sniper” chief Kim over the past year. The Business Group Bureau -- the watchdog’s key strategic headquarters for its chaebol reform initiative -- was among those subject to the raid due to its suspected collusion with the business circles. “I understand that (the prosecution’s latest raid) was not so much about the bureau’s work over the past year but because of the data that was transferred (from the previous administration),” the FTC chief claimed in his interview, in an apparent denial of the incumbent officials’ involvement with the business circles. As for the post-retirement jobs of its officials, the watchdog made a stronger rebuttal. 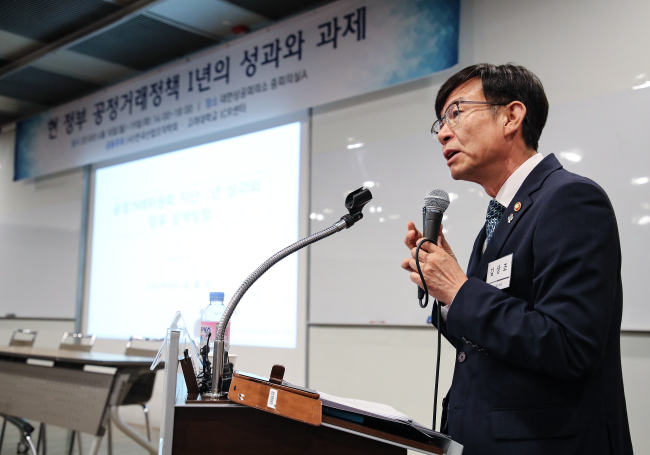 “The Korea Federation of Small and Medium Business is not subject to the employment restriction (for retired public servants),” the FTC said in a release, referring to a former FTC vice chairperson who served as the federation‘s auditor and returned to the FTC this year. The nation‘s powerful antitrust watchdog has long been under pressure to scrap its effectively exclusive right to charge businesses for fair trade violations which dissenters claimed as useless tools against chaebols’ power abuses against smaller market players. The related law was partially alleviated in 2014 to allow other organizations to request the FTC to file a given case to the prosecution. The watchdog, however, recently introduced a new administrative guideline to allow itself expanded autonomy on prosecutorial charges, rekindling conflicts with the prosecution. Meanwhile, the FTC is currently working on submitting a revision bill of the current Monopoly Regulation and Fair Trade Act as early as next month, but is seen as unlikely to abolish the disputed power range clause.